Dr. Louis A. Martin-Vega officially took the reins as the dean of the College of Engineering at NC State University on August 7, 2006. He comes to NC State from the University of South Florida, where he served as professor and dean of engineering for the past five years. 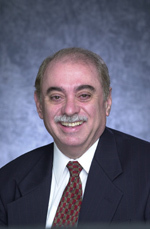 Martin-Vega has held several prestigious positions including serving as acting head of the Engineering Directorate at the National Science Foundation (NSF); director of NSF's Division of Design, Manufacture and Industrial Innovation; and chair of the Department of Industrial and Manufacturing Systems Engineering at Lehigh University. He received his Ph.D. in industrial and systems engineering from the University of Florida in 1975. Martin-Vega is a member or elected fellow of several engineering societies and organizations, and brings with him a vision and passion for elevating NC State Engineering to new heights. OPNET Technologies has provided the department with annual software licenses valued at $3.34M. This gift includes licenses and technical support for OPNET's Moduler, Wireless Moduler, UMTS, and MPLS software. The software has been successfully integrated into several undergraduate, graduate, and distance education network project courses. SAS Institute has renewed its commitment as a Super ePartner for the 2006-07 academic year, providing the department a $25,000 unrestricted gift. Progress Energy has given the department $20,000, as part of a larger grant to the NCSU College of Engineering. This funding will support CSC scholarship awards, the Senior Design Center, and the ePartners Program. The Vanguard Group has committed $2,500 to co-sponsor the department's ACM/AITP Year-end Cookout. In recognition of their support, we welcome Vanguard as an official ePartner with the department. ABB has awarded a grant to Dr. Tao Xie in the amount of $6,820, which provides much needed funding for Research Assistance (RA) support. IBM has donated $5,000 as a Gold Level sponsor of IEEE's 17th International Symposium on Software Reliability Engineering (ISSRE) 2006, which will be held here in Raleigh in November. Congratulations to Drs. Laurie Williams (more) and Frank Mueller (more), who have both been selected to receive 2006 IBM Faculty Awards. Williams' award is valued at $27,000, and Mueller's at $20,000. The ISSA Raleigh Chapter and several of its members recently contributed $500 to the Charles Kelly / ISSA Scholarship Endowment fund. UT Battelle / Oak Ridge National Lab has provided supplemental funding of $63,634 to extend their joint support of the work being performed by Dr. Xiaosong Ma through August 15, 2007. Specifically, this supports research parallel I/O in conjunction with the Genomes to Life (GTL), Scientific Data management, and RAS (Reliability, Availability, and Serviceability) for Terascale Computing projects within the Computer Science and Mathematics Division at ORNL. Total related funding provided to date totals $253,484. Dr. Douglas Reeves has received a grant of $137,057 from the National Science Foundation in support of his research proposal titled "CT-ER: Metamorphic Worm Detection". The award will run from August 15th, 2006 through July 31st, 2008. Drs. Injong Rhee and Mihail Sichitiu (ECE) have received a grant of $484,827 from the National Science Foundation in support of their joint, multi-departmental research proposal titled "NeTS-NBD: Measurement-Based Mobility Modeling for MANETs Source". The award will run from August 15th, 2006 through July 31st, 2009. Our annual ePartners Career Connection event is scheduled for Wednesday, October 4th from 10 am to 2:30 pm in the atrium and the main classroom hallway in the east (CSC) wing of EBII. This event, provided exclusively for CSC students and our valued ePartners, will feature representatives from Network Appliance, Cisco Systems, EMC, I-cubed, Vanguard, Itron, and the NC Office of the State Auditor, just to name a few. Students are encouraged to bring their resumes and to be prepared to explore career opportunities ranging from part-time coop and intern roles to full-time new grad positions. Registration deadline for ePartners is Sept. 22nd. Young Alumni - Want to be a Star? 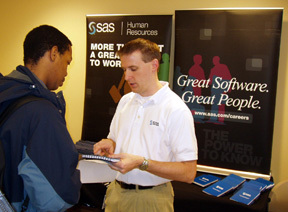 Are you a recent new grad (2002 - present), and love your job and where you work? If so, we'd like to talk to you about being in a video we have planned as a recruiting tool for prospective CSC students. If interested, please contact Ken Tate at 919-513-4292 or kmtate2@ncsu.edu. It is with great sadness that we report that one of our students, Mr. Guilherme Tavares De Oliveira, was killed in a tragic automobile accident on Monday, August 7, 2006. Gui, as he was known by his friends, was a senior in Computer Science. He is survived by his father and stepmother, Willer and Ines De Oliveira of Mt. Pleasant S.C., and his mother and stepfather, Marilia and Clarence Carter of Hickory, NC. Dr. Kermit L. Hall, who served as NC State's Provost from 1999-2000, died of an apparent drowning accident on August 13th while vacationing with his family in Hilton Head, SC. The very popular and much-loved Hall left NC State in late 2000 to become the president of Utah State University. In 2004, he became the president of the State University of New York's University at Albany in 2004. The department is compiling a list of qualified and interested alumni who would like to serve as adjunct faculty in the future. Such paid adjuncts typically teach just one class per semester, allowing them to continue working full time with their employers. If interested in being considered, please send your day-time contact information and your area of expertise to Ken Tate. Accessibility is all about eliminating barriers. Smart design that adheres to accessibility guidelines makes it easier for people with disabilities to use online applications. Through its "Accessibility ODF Coding Challenge 2006", Super ePartner, IBM invites undergraduate students to learn more about accessible information technology and to create code that uses OpenDocument Format (ODF) to help make technology more accessible to people with disabilities. Two grand prize winners per region will receive a Lenovo ThinkPad laptop and a trip to attend the March, 2007 California State University, Northridge Center on Disabilities' 22nd Annual International Technology and Persons with Disabilities conference in Los Angeles. Ten regional runners up will receive an iPod® Nano, and 200 students per region will receive an official contest t-shirt. Students can review contest start dates and rules, and register at: http://www.ibm.com/able/contest/. As part of the Research and Professional Ethics Program at NC State University, Dr. Annie I. Antón, associate professor of computer science, has been named a Senior Research Ethics Fellow for the period of 2006-08. Congratulations to Drs. Peng Ning, Laurie Williams, and Michael Young, on their promotions to associate professor. Dr. Ning's research interests are mainly in computer and network security, particularly in new techniques for intrusion detection and security in sensor and ad hoc networks. Dr. Williams' research interests are in agile software development methodologies and practices, collaborative/pair programming, software reliability and testing (particularly of secure applications). And Dr. Young's research interests are in artificial intelligence, including planning and plan recognition, natural language processing and the development of computational models of human-computer interaction, task-related discourse, interactive narrative and the design of intelligent systems in computer games. Sept 5 - ACM/AITP Mtg - 7-8 PM in Room 1025 EBII. Sponsored by Super ePartner, EMC. Steve Worth, Director, SPO Global Engineering at EMC presents "Key Skills to Survive In a Flat World". Sept 19 - ACM/AITP Mtg - 7-8 PM in Room TBD. Sponsored by Super ePartner, Cisco System. Oct 26 - ISSA's Triangle InfoSeCon - Cary Embassy Suites Hotel. Nov 28 - ACM/AITP Mtg - 7-8 PM in Room TBD. Sponsored by ePartner, The Vanguard Group. Richard Holcomb (MS '89), serial entrepreneur and founder of numerous companies such as HAHT Commerce, Q+E Software, GadgetSpace, and StrikeIron, is now co-owner of Zely & Ritz, a new restaurant in downtown Raleigh which specializes in fresh, organic, locally grown dishes.